The most interesting game was a derby match between two local teams from Beirut: Beirut Club (#4) and Homentmen (#3). Beirut Club (11-4) won against visiting Homentmen (11-4) 86-81. Beirut Club looked well-organized offensively handing out 25 assists. American guard Chris Crawford (193-92, college: Memphis) had a double-double by scoring 18 points, 5 rebounds, 12 assists and 5 steals to lead the charge for the winners and the former international forward Ali Haidar (201-90, college: Michigan Tech) chipped in 17 points and 9 rebounds during the contest. The best for the losing side was Nigerian-American guard Michael Efevberha (193-84, college: CS Northridge, agency: Octagon Europe) with 20 points and 6 rebounds. Beirut Club have an impressive seven-game winning streak. They moved-up to third place, which they share with defeated Homentmen. Third ranked Al Riyadi (11-3) crushed at home 9th ranked Sagesse (1-13) by 16 points 104-88, which is the biggest margin this round. Naturalized Egyptian power forward Ahmad Ismail (205-76) notched a double-double by scoring 17 points, 7 rebounds and 11 assists to lead the effort and Jean Abdel-Nour supported him with 22 points and 10 rebounds. Even 27 points and 5 assists by American guard Ramel Curry (191-80, college: CSU Bakersfield) did not help to save the game for Sagesse. Al Riyadi keeps a position of league leader, which they share with Champville. 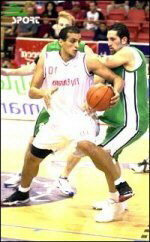 Sagesse lost twelfth consecutive game. They stay at the bottom place with 13 games lost. Third ranked Al Riyadi (11-3) crushed at home 9th ranked Sagesse (1-13) by 16 points 104-88, which is the biggest margin this round. Al Riyadi players were unselfish on offense dishing 24 assists. Naturalized Egyptian power forward Ahmad Ismail (205-76) notched a double-double by scoring 17 points, 7 rebounds and 11 assists to lead the effort and the former international swingman Jean Abdel-Nour (198-83) supported him with 22 points and 10 rebounds. Even 27 points and 5 assists by American guard Ramel Curry (191-80, college: CSU Bakersfield) did not help to save the game for Sagesse. 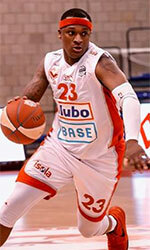 Canadian power forward Keanau Post (211-92, college: Missouri, agency: Slash Sports) added 18 points and 12 rebounds. Five Al Riyadi and four Sagesse players scored in double figures. Al Riyadi keeps a position of league leader, which they share with Champville. Sagesse lost twelfth consecutive game. They stay at the bottom place with 13 games lost. The most interesting game was a derby match between two local teams from Beirut: Beirut Club (#4) and Homentmen (#3). Beirut Club (11-4) won against visiting Homentmen (11-4) 86-81. Beirut Club looked well-organized offensively handing out 25 assists. American guard Chris Crawford (193-92, college: Memphis) had a double-double by scoring 18 points, 5 rebounds, 12 assists and 5 steals to lead the charge for the winners and the former international forward Ali Haidar (201-90, college: Michigan Tech) chipped in 17 points and 9 rebounds during the contest. The best for the losing side was Nigerian-American guard Michael Efevberha (193-84, college: CS Northridge, agency: Octagon Europe) with 20 points and 6 rebounds and U.S. Virgin Islands-Puerto Rican point guard Walter Hodge (183-86, college: Florida) scored 19 points and 6 assists. Both teams had four players each who scored in double figures. Beirut Club have an impressive seven-game winning streak. They moved-up to third place, which they share with defeated Homentmen.